Moscow’s Domodedovo Airport is one of the largest in Russia. In 2016, the airport serviced 28.5 million passengers, and it’s the only Russian airport that on a regular basis welcomes the Airbus A380, Airbus A350-900 and Boeing 787 Dreamliner.In the 21st century, the most popular international routes from Domodedovo have been: Antalya (Turkey), Hurghada (Egypt), Sharm El-Sheikh (Egypt), London (U.K.) and Dubai (UAE). Among domestic destinations, passengers most often fly to St. Petersburg, Sochi, Yekaterinburg, Novosibirsk and Krasnodar. 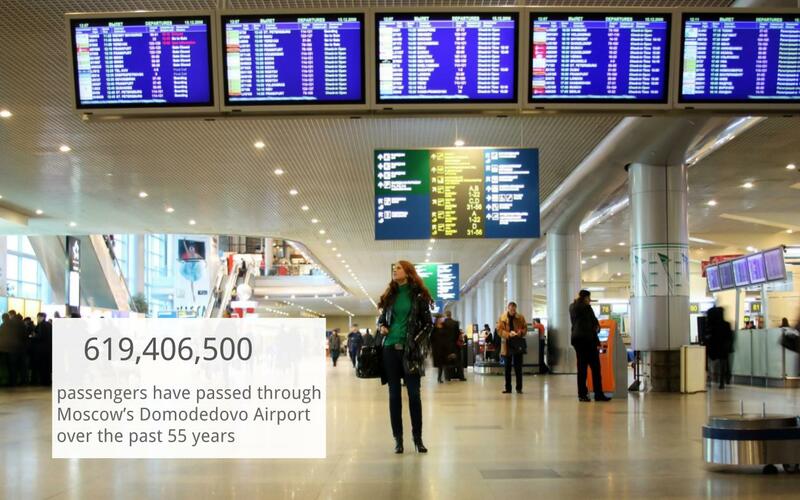 Moscow’s Domodedovo Airport is one of the largest in Russia. In 2016, the airport serviced 28.5 million passengers, and it’s the only Russian airport that on a regular basis welcomes the Airbus A380, Airbus A350-900 and Boeing 787 Dreamliner. In the 21st century, the most popular international routes from Domodedovo have been: Antalya (Turkey), Hurghada (Egypt), Sharm El-Sheikh (Egypt), London (U.K.) and Dubai (UAE). Among domestic destinations, passengers most often fly to St. Petersburg, Sochi, Yekaterinburg, Novosibirsk and Krasnodar.